When I was little, I strongly disliked cooked carrots. I still don’t love them, but their sweetness makes them an incredibly important vegetable in the cooking world. And when it comes to baking, they are one of the only vegetables to have their very own cake. I came to enjoy carrot cake later in life. The two biggest issues with carrot cake recipes are: (1) the carrots within the cake are too firm, and (2) the cake can be dense and dry, trying to get by only on the moisture in the frosting. I can humbly report that my recipe solves these issues. Tossing the grated carrots in brown sugar and letting them sit for one hour in advance makes them tender. 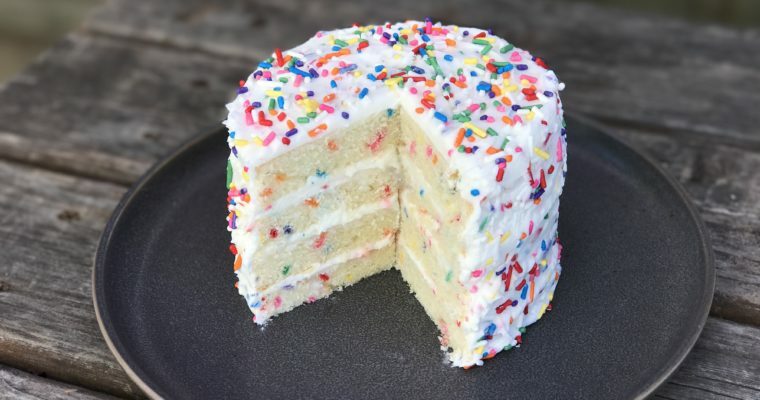 The use of crushed pineapple makes the cake both moist and light. It’s hard to say the words “light” and “cake” together, but trust me, this one is. The light, fluffy layers are a refreshing change to the uber dense carrot cakes one often finds in bakeries. 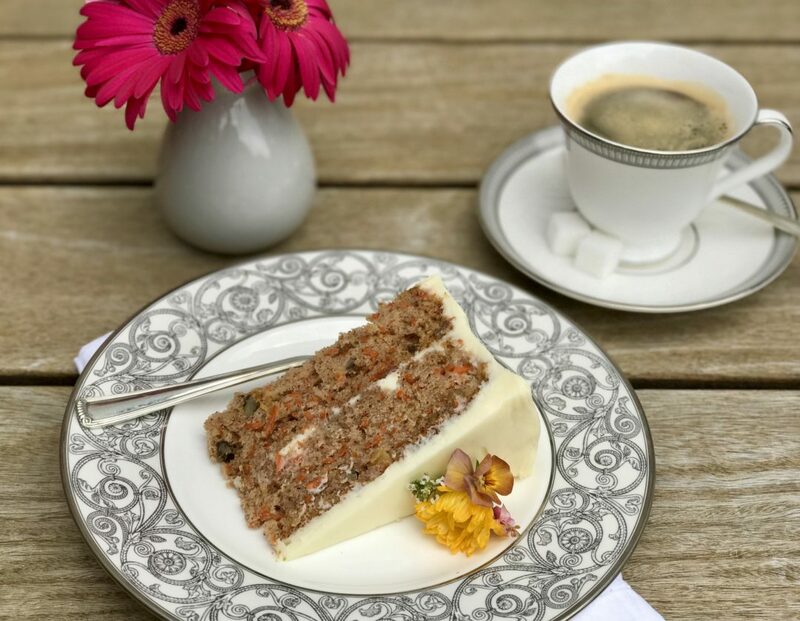 Carrot cake has been around for many years: so long that there is actually still dispute about how long. But recipes have been traced as far back as 1827. In Switzerland, carrot cake is one of the most popular cakes, sold commonly for children’s birthdays. Carrot cake did not become popular in the United States until the 1960’s, but it quickly became a standard American dessert thereafter. It is often listed with apple pie in terms of overall favorites. So despite my strong dislike of cooked carrots, I love this cake. And considering how good carrots are for you, I’m glad I’m getting them in somehow. Step 1 In a medium mixing bowl, add the grated carrots and brown sugar. Mix well to combine. Set aside and let rest for 60 minutes, mixing occasionally. Step 2 Preheat the oven to 350 degrees F. Lightly grease and flour two round 10-inch cake pans. Set aside. Step 3 In a medium mixing bowl add the flour, baking soda and cinnamon. Mix well to combine. Set aside. Step 4 In a kitchen mixer, such as a KitchenAid fitted with a paddle attachment, add the sugar and eggs and mix well on medium speed until light and fluffy. Step 5 Add the oil and vanilla extract and mix well to combine. Step 6 With the mixer on low, slowly add the flour mixture. Mix well to incorporate. Step 7 Add the pineapple and mix well. Step 8 Remove the bowl from the mixer and, using a rubber spatula, fold in the walnuts. Step 9 Pour the cake batter into the two prepared cake pans. Bake on the middle rack for about 35-40 minutes until firm on top and a cake tester comes out clean. Step 10 Allow cakes to cool completely before trimming and frosting. Step 1 In a kitchen mixer, such as a KitchenAid fitted with a paddle attachment, cream the butter and cream cheese on high until smooth and well incorporated. Add the vanilla. Step 2 With the mixer on low, slowly add the sugar and mix well. Put the mixer on high to make the frosting very smooth and free of any lumps. You make me want to bake! 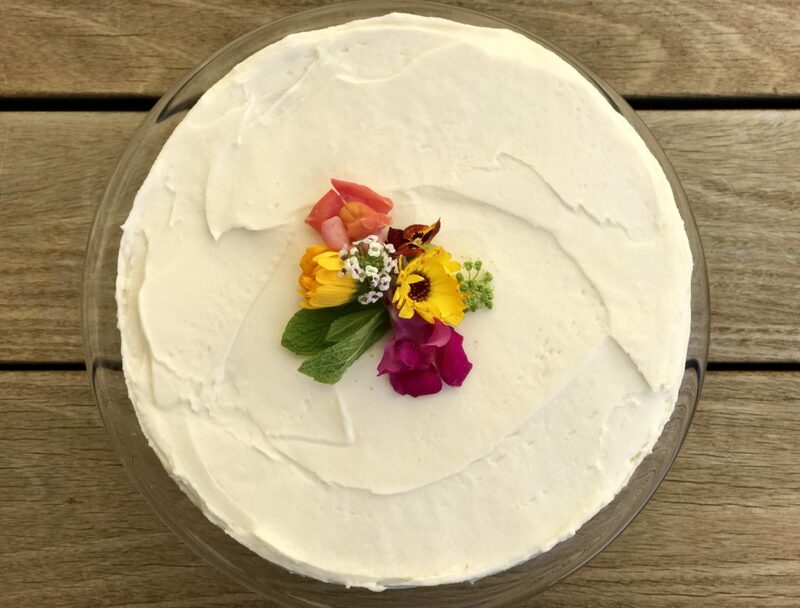 Carrot cake is gorgeous and looks mouth-watering delicious.